Did you find this page while looking for “the #Swift equivalent of this #ActionScript piece of code”? Or are you looking to transfer your #Flash skills into native #iOS development? In either case, you are in the right place. If you have spent some time making Flash apps and coding in ActionScript, you are well on your way to knowing your way around Swift and won’t need to start from scratch. We have collected some resources that can help on your learning journey: they have been created with your experience in mind and by developers who speak your language – after all, they have made the same transition! Online articles for when you need quick info on specific topics. Books for when you are ready to take the plunge. SDKs if you want to get your hands dirty right away. 1. Yeah, but is it Swift? If you are new to Swift and need a crash course that will help you hit the ground running, start here. 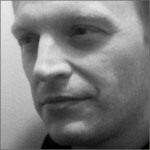 YeahButIsItSwift.com offers a series of articles by Christopher Caleb, whom most of you know for his Flash, Adobe AIR and HTML5 tutorials published on YeahButIsItFlash.com and in his Flash iOS Apps Cookbook. The series has four parts, but don’t let the modest number of posts on the website fool you. Each part covers a lot of ground with simple and easy to follow examples. – Part 1 helps you set up a Playground in Xcode – the IDE, which you will be using to create apps with Swift. The introduction to Swift starts gently with looking at its syntax and gradually leads to specific topics such as Optionals and their application in the language. – Part 2 builds on your knowledge of the Swift basics learnt in Part 1 and expands it to include container types and more powerful control flow techniques. It also introduces Enums – something that’s been missing in ActionScript 3. – Part 4 of the series takes you into the OOP realm of Swift and you learn how to use classes, how they differ from structures, how initialization and property observers work. Yeah, but is it Swift? was among the early tutorial series to appear online and the code in the examples works with earlier versions of Swift. There are plans for an update to Swift 3 soon, however, so watch this space. Once you have the basics covered, you will probably want to dip in and out of certain topics as the need arises. Craig Grummitt‘s blog, unassumingly titled “Before I forget…”, contains a series or articles which deal with some of the specifics of Swift. It also shows you how to work with user interface and manage your projects in Xcode. Popups, Popovers, Pushing, Popping, Presenting, Alerts and Actionsheets! Xcode Keyboard Shortcut for CamelCase! When you are ready to jump into deeper waters, check out The Swift Series by Thibault Imbert, published on TypedArray.org. We couldn’t publish a list of Swift resources without shamelessly plugging our own book, “Migrating to Swift from Flash and ActionScript”. We have designed it to be a one-stop-shop in your transition to Swift, using Xcode and making iOS apps by building on your prior knowledge. The book guides as you adapt not only to a new programming language but also to a new set of programming tools and workflow. You can read it from cover to cover or use it to refer to the topics you need in whatever order you need them – pretty much all chapters are self-contained. It can be frustrating when there is work to do and stuff to set up before you can run your first line of code on a device and only Google to search for answers. This part of the book helps you breeze through that and shows you what Xcode has on offer in terms of development tools. All set up, now how do you create your user interface? How do you make it adjust itself to different screen sizes and orientations? How do you get code to run in the background and how do you make the most of the debugger? This part of the book deals with these and more workflow-related questions. This part comes with 12 self-contained tutorials for practical apps you may want to build: from posting to social networks and using the camera to producing high-end graphics. You have been learning how to code with Swift throughout the whole book. However, it is helpful to have a reference, which is focused on the language itself. Here Swift is presented from the point of view of your current experience with other OOP languages, especially ActionScript 3. That’s the point of making apps, right? Releasing an app in Apple’s App Store includes jumping through hoops that are far from intuitive… We hope that the tips in this chapter help you navigate them and have a smooth sail. 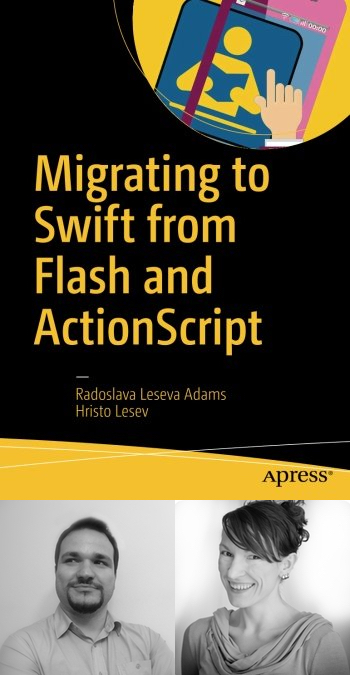 “Migrating to Swift from Flash and ActionScript” is available from all major booksellers. Find out more and preview selected chapters here. This is the new book by Craig Grummitt we mentioned earlier. Craig is working on it as we speak (ok, as I write and you read) and it’s very exciting to see new chapters appearing on the publisher’s website in real time thanks to the Manning Early Access Program (MEAP). 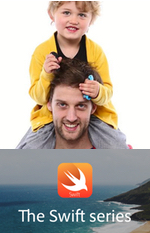 It has a gradual approach in taking you from zero to becoming a proficient Swift developer. – In Part 1 you get familiar with Xcode as your new IDE, try out Swift in a Playground and make your first app with it. – Part 2 helps you with building your app’s user interface and understanding Layouts and user interaction among other things. – Part 3 shows you how to build the backend of your app and deals with topics from working with data and iCloud to threads and networking. – Part 4 adds finishing touches to app development: testing your code and distributing your app. At the very end of the book, you will find Swift syntax cheat sheets for quick reference. You can see a short presentation of the book here, and follow the book’s progress and download Chapter 1 for free from the publisher’s website. We are looking forward to the book’s release in July 2017! If you are a ‘ready-fire-aim’ kind of learner (aren’t we all?! 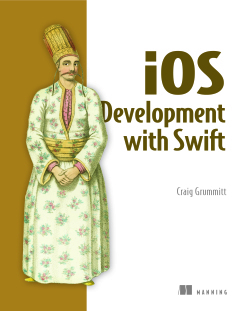 ), you may want to take Swift into a familiar corner, use it for a bit and then commit to reading books and articles about it. Wouldn’t it be nice if there was an API for that? Well, read on, you are about to discover one. 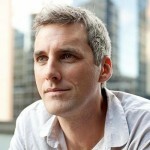 This has to be our personal favourite: an ActionScript 3 SDK in Swift by… Craig Grummitt again. What can we say, Craig is a prolific writer and programmer! If you are a die-hard ActionScript coder who would prefer a veeery gentle transition to Swift, give this SDK a go. It has been aptly named ActionSwift3 and is designed to make your first Swift projects feel as if you are still programming in Flash with ActionScript 3. Craig has ported pretty much all you need to make a viable app: from basic classes like Object, DisplayObject, MovieClip and Scene through classes for event handling, designing your user interface and, get this: even data types that you’ll be familiar with from ActionScript 3. 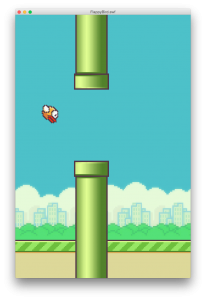 The SDK comes with a tutorial for porting your first Flash game, called “Flashy Bird”, into Swift. This is a clever trick: while you remain wrapped in cosy and familiar ActionScript 3 working on this game, by the end of the tutorial you will not only have made your first steps in Swift, but will have also set up your Swift development environment: Xcode with Cocoapods and will have learnt how to use third party libraries to boot. The SDK is open-sourced, up-to-date with Swift 3 and is available on GitHub. We hope you find this collection of resources helpful on your way to learning Swift. This relatively new language, however, and the knowledge about it, evolve with impressive speed and new learning materials become available by the minute. 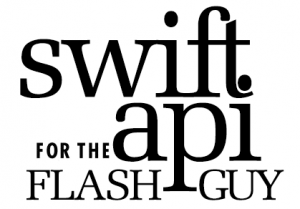 Do you know of other resources that may help a Flash developer get to grips with Swift? Post a comment below and help us keep this page up-to-date. Bring your ANEs into the now by using AIR 28 and this iOS framework to extend your AIR apps with Swift coded native functionality. 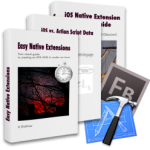 This framework wraps FlashRuntimeExtensions with Swift based syntax. let swiftString: String = "I am a string from Swift"